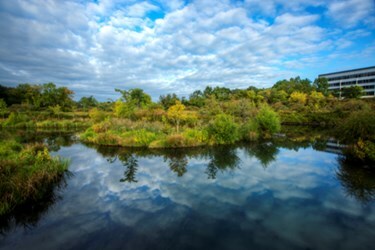 Through hydraulic computer modeling, MWH Global helped alleviate stormwater flooding in Cambridge, M.A., by creating the Alewife Reservation Stormwater Wetland to enhance water quality and provide recreational benefits to the community. Eliminate flooding for the 10-year storm. Restrict the peak discharge of stormwater to the Alewife Brook to not exceed existing conditions. Though the impetus for the project was combined sewer overflow and flood control, its environmental impact and potential benefit quickly became the focus of project stakeholders and the engineering team. The Department of Conservation and Recreation would not approve a common detention basin for storage of sewer overflows. This led to the concept of an engineered stormwater wetland and resurrection of The Great Swamp. The value of the wetland is felt by Cambridge’s citizens. Public health is improved through reduced sewer system overflows and sewer backups into basements. Nuisance flooding in the public right of way is reduced. Citizens are also recognizing an increase in their quality of life. The wetland features walking paths, boardwalks, disabled access, an amphitheater and educational signage. Since 1998, MWH has been engaged by the Cambridge Department of Public Works to engineer a sewer separation project in Massachusetts. The sewer separation project lies within the Alewife Brook watershed, features an engineered stormwater wetland. The wetland was completed in October 2013 as part of $117 million in ongoing construction that will reduce combined sewer overflows from the city’s ‘CAM 004’ area by 84 percent (43.6 million gallons annually). The role of MWH in this project began with creation of the city’s first hydraulic stormwater model using Innovyze’s (a subsidiary of MWH) InfoWorks software. This critical tool allowed for an integrated analysis of the watershed’s natural and piped systems and recommendation of the wetland. The resulting project will treat urban runoff from 400 acres of dense residential and commercial land adjacent to the city’s Fresh Pond potable water reservoir. It also achieves peak flow attenuation so that flooding along the Alewife Brook in downstream communities such as Arlington and Somerville is not exacerbated. The new wetland is an ecological filter with physical and biological treatment. In the first stage, fine sediment is allowed to settle in an articulated concrete block forebay where the resulting sediment is trucked out for disposal. Stormwater then winds its way through a vegetated swale before entering the main basin where wetland biota remove nutrients and other pollutants. This journey improves water quality at the wetland’s outlet to the Little River and further downstream in the Alewife Brook. The wetland also provides stormwater storage and is surrounded by a six-foot earthen berm designed to retain a 10-year event. A series of passive stormwater management devices (bending weir, vortex throttle, downstream level controller, and multiple flap gates) optimize storage by regulating water levels and flow rates in upstream pipelines. The pipelines also feature BMP catch basins, flushing systems and deep sump manholes to capture grit and floatables. The 3.5-acre wetland is sited in the Alewife Reservation, conservation land that was once noted by 19th-century naturalist William Brewster as “The Great Swamp”. The design included environmental engineering to minimize the construction and long-term impact to the ecology and aesthetics of this valuable open space. A significant regulatory coordination effort was undertaken to achieve a consensus on the wetland’s function, configuration, and impact on hydrology and water quality. The wetland was also conceived to add biodiversity and encourage the return of native wildlife. Over 100,000 wetland plants stabilize the landscape, with trees and upland species placed along a bike path, visitor’s entry way and peninsula. The site now features habitat such as riparian woodland, shrub swamp, emergent marsh, wet meadow and open water. Animals recently sighted include alewife, swan, heron, mallard, bullfrog, snapping turtle, deer and muskrat. Visitors have access to a half-mile long boardwalk with panoramic views, a platform overlooking a man-made oxbow at the Little River, and an amphitheater with educational signage. This project is a showpiece of 21st century ‘green technology’ and a benchmark for sustainable integration of stormwater infrastructure with the natural environment.